Mumbai is a city where the people are like their lunchboxes. The city ferries millions from their homes to their place of work and then back with the evening commute, like items on a conveyor belt. In a constant race that Mumbai imposes upon its residents, they can never stop to ponder their dreams or what became of them. It is a fortuitous accident that the hot lunch that Ila has so lovingly prepared for her otherwise oblivious husband, is mistakenly delivered to Saajan, a senior accountant on the verge of early retirement. The two lonely strangers, Ila and Saajan find solace in the most unexpected of correspondences, as they help one another to reconnect with lost dreams and take accounting of their lives. This is the premise for Ritesh Batra’s charming and tender film, The Lunchbox. The Lunchbox is one of the first really great films to emerge fresh from Sundance Film Festival 2014 that audiences will have a chance to see in theatres starting this week. The setting is Mumbai (also known by its former name, Bombay) — capital city in the Indian state of Maharashtra and the most populous city in India. With 20.5 million residents, it is the fifth most populous city in the world. Each morning, the Dabbawallahs, or lunchbox delivery men, deliver hot meals direct from the kitchens of Indian housewives to the offices of their husbands, returning the empty lunchboxes late each afternoon. “For 120 years, they have provided the people of Mumbai with a taste of home in the office,” explains director-screenwriter Ritesh Batra. The film features three outstanding performances: Irrfan Khan, who you will likely recognize from films that include Life of Pi, Slumdog Millionaire, and The Namesake, plays the reluctant retiree Saajan; star of the Indian stage Nimrat Kaur (Peddlers) plays forlorn housewife Ila; and the facile and comical Nawazuddin Siddiqui (Talaash, Gangs of Wasseypur) plays Shaikh, the newest office recruit that Saajan must train to assume his place. 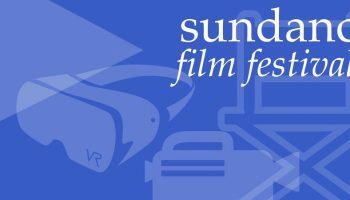 The Lunchbox debuted during Semaine De La Critique at 2013 Cannes Film Festival, where it received the Grand Rail d’Or audience choice award, and the film has been showered with critical acclaim and accolades at festivals throughout the world since, including Telluride, Toronto, Odessa, and Rykjavik, to mention a few. Many Sundance festival goers told me that The Lunchbox was a personal favorite, a sentiment with which I concur. The Lunchbox is a film of such heart and humanity, that I anticipate watching again and again, and I can hardly wait to see what director-screenwriter Batra is cooking up next. I had the opportunity to speak with Ritesh Batra in Mumbai, by phone last week, to get his take on the Dabawallahs, nostalgia, and the measure of a great film. Nawazuddin Siddiqui (Shaikh), Denzil Smith (Mr. Shroff), Director Ritesh Batra, and Irrfan Khan (Saajan), The Lunchbox. Photo by Michael Simmonds, Courtesy of Sony Pictures Classics. Sophia Stein: Back in 2006, you were researching lunchbox delivery men (Dabawallahs) for a documentary. Did the Dabawallahs deliver hot lunches that your mom would prepare each day to your father? Ritesh Batra: Yeah, yeah. The system is rather commonplace for me because it is part of the daily fabric of life in Mumbai. I didn’t really think much about it growing up. It was only when I left India and lived in the U.S., and then returned to India that it felt like a different country. That’s when I decided to look into making a documentary about the Dabawallahs. I was never that interested in documenting the process — the coding system and how they are able to do this. I was more interested in finding a story from the workers about the relationships they form. Early on, I abandoned the documentary. I started to write a story about a woman who tries to save her marriage with her cooking. That idea evolved. “What if the lunch she had prepared for her husband was delivered into somebody else’s life instead?,” I wondered. And it just took off from there. The thing about The Lunchbox — it just came from a place of character really. I wanted to connect these two characters, Ila and Saajan. S2: As you indicate in the film, Harvard University analyzed the delivery system of the Dabawallahs and concluded that only 1 in 6 million lunchboxes is ever delivered to the wrong address. That is quite a statistic! RB: I read that statistic and thought, if it happens only 1 in 6 million times, then when it happens, it’s really not a mistake. It’s really a miracle! Ila lives in Kandivili, the conservative middle class Hindu enclave, and Saajan lives in Ranwar village, Bandra, an old Christian neighborhood. These two characters would have never crossed paths if it were not for this lunchbox delivery mistake, this miracle of the big city. I find myself drawn to stories that have a sense of how ridiculous life can be at times, and that find something interesting in the mundane. S2: Where were you raised? RB: I was raised in Mumbai, India, and I came to the states when I was eighteen, to go to college. I grew up in the Bandra neighborhood, which is where my character Saajan is from. My dad is in the merchant marines and my mom is a yoga teacher. S2: When did you realize that you wanted to become a screenwriter and a film director? RB: I thought about it, but I didn’t ever think that it was much of a possibility. Here in India in my childhood, not many people were making movies. It was not something that I could really do. So I studied economics as an undergrad, and I worked as a consultant for three years for a firm called Deloitte. Then I quit my job and I went to NYU film school, which was just something that I’d always wanted to do. When you actually are doing something that you don’t enjoy, you can’t imagine doing it all your life. So I made a short film for a film school application, and that just made me even more sure that I just really wanted to direct films. 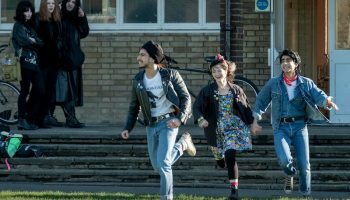 S2: “The Lunchbox” has been called an “off-Bollywood” Indian Movie. In what ways, is it “off-Bollywood”? RB: Bollywood produces 900 movies a year. It is really such a specific language of cinema. Bollywood is its own thing. It has a lot of splendor. For me, it is a guilty pleasure. I would watch a Bollywood movie every now and then, but I could not make one. We independent filmmakers in India are really making films for the world. We want to speak to a world audience. The Lunchbox ran on more than 600 screens in theatres here in India for several weeks. The Lunchbox is definitely not Bollywood, but then I wouldn’t really designate anything I make in the context of Bollywood. Nimrat Kaur (Ila), The Lunchbox. Photo by Michael Simmonds, Courtesy of Sony Pictures Classics. S2: You created three such rich and wonderful characters. First we are introduced to Ila, who with the aid of her upstairs Auntie, is trying to spice up her marriage, to arouse her negligent husband. Was she the first character of the three that occurred to you? RB: Ila was the first, then Saajan, and last, I found Shaikh. S2: Sajaan, the insurance company accountant is approaching his early retirement with great reluctance. I remember just before my father retired how tremendously conflicted he felt. Irrfan Khan (and you in your screenplay) capture that ambivalence so completely. How did your discussions with Irrfan play into the writing? RB: Irrfan is a wonderful actor. He found his way into the part through his Uncle that had lived in Bombay. 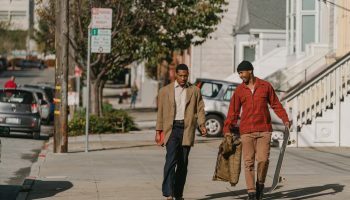 He told me a lot of little details about how he was trying to get into the role — about his Uncle’s commute, for example, and all that fell right into the movie. And it was better for it. I was very happy to write those details into the part. I was always writing. I was always trying to bring the part closer to him. I felt like it was this gift, and I just had to take it. 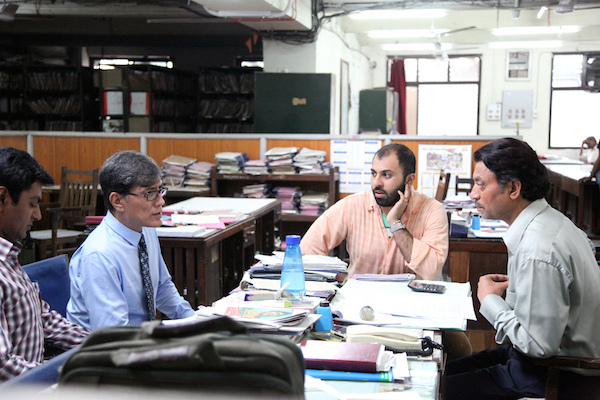 Nawazuddin Siddiqui (Shaikh) and Irrfan Khan (Saajan), The Lunchbox. Photo by Michael Simmonds, Courtesy of Sony Pictures Classics. S2: Sajaan writes to Ila – “When my wife died, she got a horizontal burial plot. I tried to buy a burial plot for myself the other day, and what they offered me was a vertical one. I spend my whole life standing in trains and buses, and now I’ll have to stand even when I’m dead.” He is really despairing at the way the world is changing. RB: I had read this news article that in the neighborhood that I grew up in, they were running out of plots. That article always chased me, and then that article became those lines. S2: You observe that The Lunchbox is infused with your nostalgia for the early 1980’s, when you were a child growing up in Mumbai. What do you feel nostalgic for from that time? RB: You know, lots of things. Those were really much simpler times, in many ways. We had only one T.V. channel, and we all used to watch the same thing at the same time. There was something about that. It was good to have had that communal experience (that you can’t have anymore). Even though everyone was in their own homes, everyone was watching the same thing. My daughter is sitting on my lap in front of the computer right now, and whenever she is in front of my computer, she reaches up to touch the screen, and I have to tell her, “No, no, it is not touch screen.” We had telegrams back then, and when you placed long distance calls, you had to go through an operator. The thing about nostalgia is that, generally, you only remember the good things. S2: During your lifetime, what changes have you witnessed in Mumbai? RB: It is much more crowded, of course. There are many more different kinds of cars on the street. India is changing, as much as China, I think. It’s an evolving place. I shot the The Lunchbox two years ago, and really even over the past two years, it has changed so much. The whole city is a construction site. S2: You moved back to India from New York to make The Lunchbox. Is it your plan to stay in India or will you return to the United States? RB: I’m just about the material. Right now, I’m writing a film that is set in Bombay, and I am living in Poonam, a city just outside. I’m really about where the stories are. S2: You have called Shaikh the stand in for the city of Bombay. How so? RB: You know, when you are writing, you are writing from your sub-conscious mind. So it was only when I was reviewing various drafts, that I became conscious of that. Shaikh is optimistic and adaptable. He is everything that the other characters are not. Ila and Saajan are staid. Shaikh is a survivor. He is an orphan who has kept his own name and made his way through life in a tough city. Shaikh seems naïve, but he is not a victim of his circumstances. 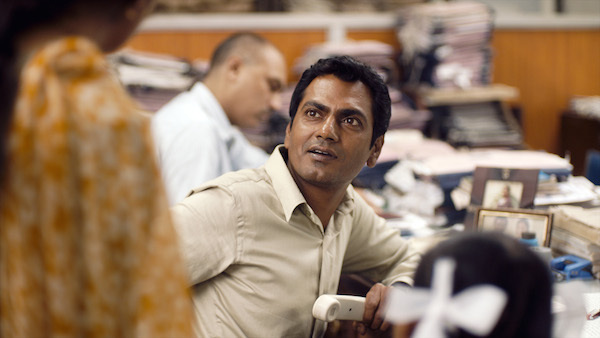 Nawazuddin Siddiqui (Shaikh), The Lunchbox. S2: You assembled a marvelous cast of seasoned actors who apparently had very different approaches to their work, leading you to observe: “I often felt like three different directors in the body of one.” How specifically did you adjust your methods in working with each actor? RB: Nawaz wanted to improvise to be in the moment because the character of Shaikh says unexpected things and is full of surprises. So I really had to give him permission to do that in our work together. Nimrat comes from a theatre background, so really she is about a lot of preparation. She has her own method, and she wanted to be in that apartment. I had the location for three months before the shoot began, so I had the production designers fix up that kitchen, and Nimrat moved in and really made the place her own. We rehearsed on location with her and the little girl who plays her daughter. We would be there every day. I was very happy to do that. The process of working with Irrfan was very organic. During the shoot, we would have discussions between takes. He was there to discover the deeper meaning of the script and read between the lines, as was I. He made this character his own in very wonderful and unexpected ways. S2: The Lunchbox is virtual romance, but with no computers. Here in the U.S. (and especially in San Francisco and silicon valley), we typically associate India with computers, but you show us an insurance company where all the accounting is done by hand and the lunch delivery system by bike. So I am curious, to what degree is this story a fable and to what degree are you documenting a reality? RB: That’s an actual office, and that’s an actual delivery system. India is such a mix of past and future together in one time. S2: You have documentary style footage in the beginning of the film, tracking one lunchbox from pick up through to its delivery. It is amazing. It really draws you into the world of the story, right from the start. Was that sequence very complicated to capture? RB: We broke the process down into seven or eight steps. We tried to do justice to do it. It took us a full week of filming. Even then, during the edit, we went back again for pick-ups. That was something that we couldn’t recreate. So we had to document it. We had to just follow it. S2: As I was watching the film, I wondered for a long time why Ila did not speak directly to the delivery man about the fact that her lunch was arriving at the wrong address each day. Towards the end of the film, when she does confront him, he’s very defensive and you completely understand why! RB: Yeah, he was just playing himself. It is a hereditary profession, and they have a lot of pride in what they do. Usually, it is really difficult in India to find real pride about manual labor. That’s what I love about the Dabawallahs. What is so interesting to me about them is that they take such pride in what they do. S2: In writing the screenplay, were you ever deliberately referencing Ernst Lubitsch’s film, The Shop Around the Corner (1940)? RB: I had seen it many years ago. Shortly after watching The Lunchbox, people starting making those comparisons, which was a great compliment, you know, to be in the tradition of that great movie. I never thought of it consciously; but sometimes we see films and they stay with us. They slip into our consciousness. I hope that my film does that for some people too because I think that it is one of the measures of a great movie. The Lunchbox is in Hindi and English, with subtitles. For more information, The Lunchbox official website. Top Image: Irrfan Khan (Saajan), The Lunchbox. Photo by Michael Simmonds, Courtesy of Sony Pictures Classics.